The CreativesMentorYou Program or /Kim-Yu/ is one of the first mentorship programs of its kind and was developed to encourage experienced individuals from all creative fields from any part of the world to give back to the creative society by sharing their experiences and learning through investing time, education and even money in young and developing creative youth in Nigeria and Africa. For its first program scheduled for 4 weeks through July – August 2019, 10 Mentors will be selected to each take on 20 – 30 young students, below the age of 18 years in Lagos, Nigeria through workshop training and complete a year of guidance through direct correspondence and mentorship. Each selected Mentor will work with Art Noise Nigeria to build and polish necessary skills and to expand his or her own professional practice. Art Noise will promote the creative’s work for the year-long duration of the Mentor program. The mentors selected for the /Kim-yu/ program are selected by Art Noise supporters and Donors to the Mentor-ship program. Mentors who join this program will work with 20 – 30 mentees for 1 year. Art Noise will be willing to provide a $500 allowance, access to accommodation, assistance with Visas and a studio space to mentors who choose to be part of the 4 week workshop classes but will not be responsible for travel or transport arrangements or allowances. All applicants must be able to cover their own travel and welfare to and within Lagos. 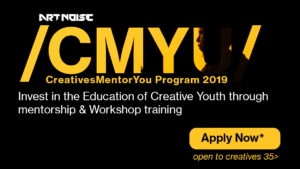 Art Noise will be accepting applications for the CMYU Program from June 30th to August 15th, 2018. All you need to do is download the Application form for Creatives Mentor You Program 2019, fill and send to arts@artnoiseng.com cc artnoiseng@gmail.com along with your portfolio or website link on or before August 15th 2018. Kindly indicate your financial capability in the mail as CMYU welcomes all mentors willing to give back even though they might not be high earning individuals. Experienced and Talented in the creative industry from diverse backgrounds. We place a particular importance in selecting creatives from communities that are underrepresented within the industry. Creatives who have a high level of professional experience and are now ready to take the next step with their career and give back to society. Note that some applicants may be considered too advanced for the program. Note that Art Noise will make allowances for advancement/skills for creatives who have had no access to formal education or training. Note that Art Noise will not be responsible for travel or transportation to and within Lagos but will be willing to assist with Visa Application and an experienced guide with detailed knowledge of Lagos and the art scene. We are looking for creatives that can demonstrate a cohesive personal aesthetic vision and are generating interesting, unexpected and mature story ideas. The portfolio should consist of stories (not just images) and demonstrate the breadth of the applicant’s experience. Every Mentor at CMYU will be obligated to abide by our code of ethics which you can read here. 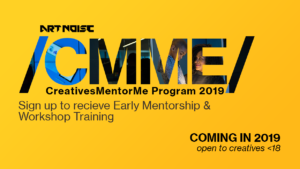 CreativesMentorMe Program /Kim-Mi/ is the other end of the mentorship program made up of creative youth below the age of 18 from all socioeconomic backgrounds who would be interested in mentorship and training. Art Noise is using this opportunity to solicit donations from anyone who would like to go the further step of not only investing time but also investing funds. The program is hoping to accommodate 200 – 300 kids and all funds will go towards providing these kids with writing, drawing materials, facilities, uniforms, computers, laptops and lunches. Applications for this program open in April of 2019, Art Noise will publish a magazine/yearbook at the end of the program thanking all its supporters and promoting the work they do and will distribute at least 5,000 copies of this magazine across Nigeria and other parts of Africa. Please find the donation link in the banner below, but feel free to email us at artnoiseng@gmail.com to schedule a meeting or make a personalized donation.